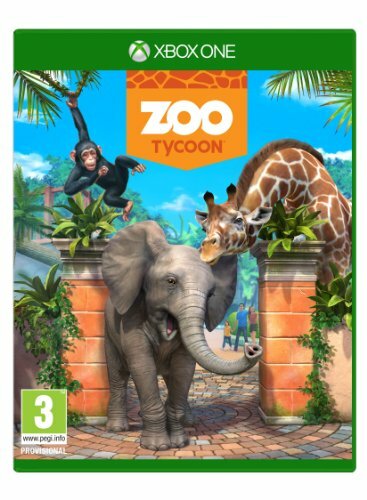 It might not have the immediate appeal of something like Ryse or Forza for those looking for next-gen thrills and spills, but Zoo Tycoon is still entertaining, it looks good and brings you family-friendly fun. Of all the launch games for the new Xbox One, Zoo Tycoon is perhaps the most surprising. It's a game that screams "family friendly" in a way that the usual line-up of racing and killing games don't. And it's as much a statement of Microsoft's intent as it is a good game. But Zoo Tycoon also tackles a genre that's not as comfortable on a console as it is on a traditional PC: the sim game. With a tick in the box against the "fun for the family" category, and an obvious showcase of what you'll get from next-gen Kinect on Xbox One, does Zoo Tycoon have all it takes to entertain? If you've ever wanted to be a zookeeper, or work with animals, then Zoo Tycoon might be just the game for you. Not only does that broad brush cover many adults, but just about every child of every age too, with universal fascination in the wide variety of animals that a zoo gives access to. Zoo Tycoon isn't as heavily involved in the running of the zoo as it is in maintaining the animals. The basic premise is to build and maintain your zoo, dropping exhibits into place, fill them with animals and then make sure those animals' needs are met. It doesn't venture into building paths, landscaping, connecting drains or any of those sorts of deep sim-game things, but you will have to make sure your animals and guests are kept happy. Zoo Tycoon remains approachable without becoming an exercise in administration: you're not so bogged down in the chores that you can't enjoy the fun side of things too - and that makes it all the more suitable for kids too. Even better, if refilling feed stations isn't what you want to be doing, you can hire staff to do it for you, if you have the cash. Life lessons right there. If all this sounds a little expensive then Zoo Tycoon gives you a free building mode. You can just settle down with infinite cash and build what you like for the sheer thrill of it. Cash isn't the real barrier to Zoo Tycoon success: you'll also need fame. Fame is really the elixir in Zoo Tycoon, because as your fame level increases, so too does the range of exhibits and animals you can place within them. Fortunately, the fame counter increases readily enough - if you launch off on an epic zoo building mission within a few hours you'll have a high enough fame level to do most things. However, to stop the freeform zoo building more or less destroying everything the game offers, you'll have to complete various tasks to get more of the zoo world unlocked. It's well balanced so you never feel as though you're limited in what you can achieve. There are a range of different gameplay options in Zoo Tycoon. First up there's a tutorial "training mode" that will walk you through the basics. It's long enough to learn all the basic skills, but moves fast enough as to not get stale. We put the training mode into the hands of a six-year-old and it worked well: she found it gave her not only a guide to the skills she'd need in the game, but also the familiarity with the controls to make it playable. Aside from the freeform building mentioned previously, theres's a challenge mode, where you're tasked with solving a problem or meeting particular criteria. Again, these little fun challenges help you focus on the task and make things more difficult, especially when on limited time or in-game budget. Finally there's campaign mode which is more difficult and gives you unique rewards as you progress through each section. This means you build up to have more items to place in your zoos. Loosely speaking, the different gameplay options will appeal to different gamers, so there's something for everyone. There's also the option to make it a co-op zoo - link up with friends who also have the game to tackle challenges and build together. Being Xbox One that includes Skype chat if you want too. Within the game itself there are two different views. There's the top-down view that's typical of sim games which will enable you to navigate around the environment quickly, but you can also get to all the information from this view and build and maintain things. To do so might be a little boring, however, because one of the strengths offered by Zoo Tycoon is that you can get right into the action via the over-the-shoulder view. You can walk around your zoo, you can interact with animals and explore the places you create. There's a notifications system that will alert you to problems you need to deal with. If your elephants are running out of food, you'll be alerted and taken straight to the problem in question. The alternative, of course, is to walk there, or use one of the park buggies to drive. One of the strongest elements of Zoo Tycoon is how it puts Kinect to use. You can speak to action some of the in-game commands, which is handy, but it's Kinect's camera that adds a lot of family fun. Set-up activity stations where you can interact with the animals in the exhibit. You'll be able to feed elephants, offering food, with Kinect tracking your actions, or you can get close to the chimps and play a mimicking game, with your face being reflected in the glass. It's very clever and something that kids big and small will love. We did have some recognition problems, though, especially when trying to feed the elephants. If you play as a straightforward top-down sim you'd miss these sorts of things, so mixing it up is definitely the way to play. Zoo Tycoon, although simple to get started with, doesn't automate everything for you so there's enough of a challenge and investment. But a lot of the fun comes from the wealth of information about the animals themselves and how such learning can help guide your decisions. To succeed you'll have to put your animals in the right sort of environment for them and give them the right food and cater for their needs. This involves making informed decisions, researching what the animals' preferences are - and it's not a one solution fits all approach. There's a wide array of animals, including different varieties of giraffe, for example. In many cases, there's plenty to be learnt about different types of animals, their status in the wild and so forth. Some of the gameplay reflects the conservation role of zoos too. You're encouraged to have an active breeding programme which has the benefit of bringing baby animals into the zoo for extra cuteness - and to the delight of visitors - but you can also release animals back into the wild. Zoo Tycoon is a playable, family-friendly game. There's plenty to get involved with, but most importantly, the game design means that the Xbox One - the game is also available on Xbox 360, but without all the features - isn't just the preserve of adult gamers. There's plenty here for children and with Xbox One wanting to be an all-round entertainment package, the game is a platform to show off online co-op integration and Kinect voice and gesture interaction. The game is as much about the well crafted visuals as it is crafting a zoo. It might not have the immediate appeal of something like Ryse or Forza for those looking for next-gen thrills and spills, while fans of dig-deep sim games will likely find the content a little fluffier than something like SimCity. But Zoo Tycoon is still entertaining, it looks good and brings you family-friendly fun by the bucket load.